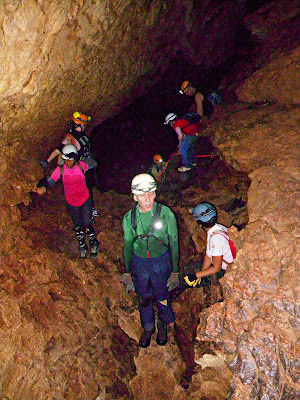 The Kruse Chronicles Continue in New Mexico: Cueva Los Chorros - Very Interesting...Like 3 Caves in One! 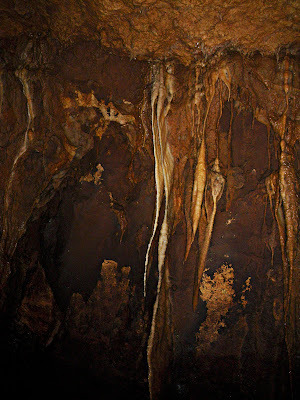 Cueva Los Chorros - Very Interesting...Like 3 Caves in One! We were invited to join a small group of people going into Los Chorros. Any cave that starts out like this is going to be good! 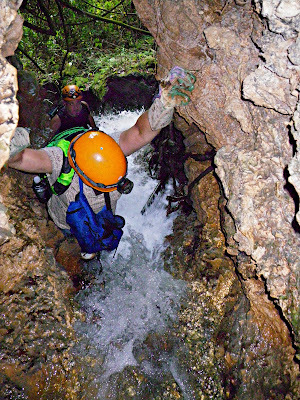 We were told we should expect to be wet, not need climbing gear and that we would be going behind the waterfall to get to the cave. Some how this was not what we were expecting. The cave is the tunnel (or series of tunnels) made by the water that is in this underground river that cascades out the mountain as a waterfall. 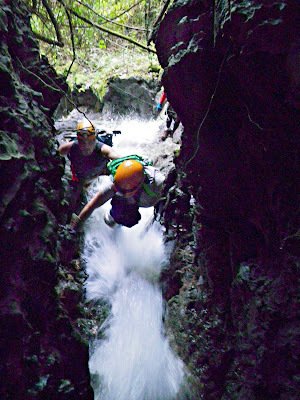 To get into the cave you follow the waterfall up to where it comes out. 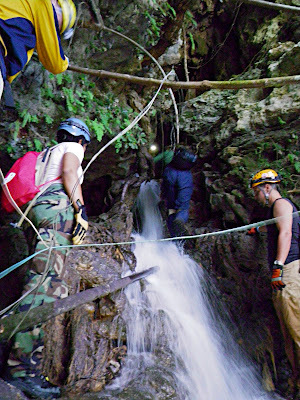 There was quite a bit of force and the rocks were slippery but Manuel stood at the slippery part to help out any one in need. Once everyone was through the waterfall and into the cave the water was pretty still and shallow and we headed up river. 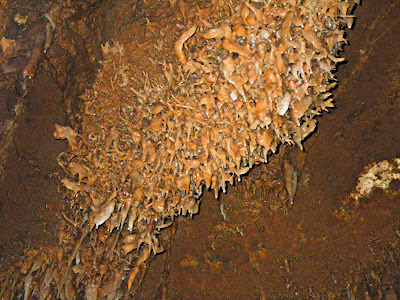 This cave reminded us of Zumbo, maybe it is a future Zumbo - the formations were similar in places but not as polished. 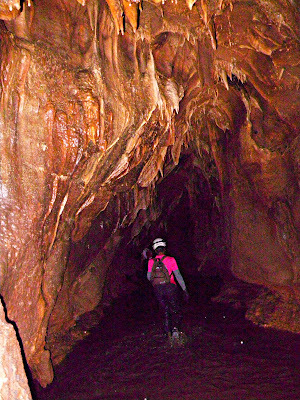 The narrow tunnel was a darker rock and had all kinds of different formations. After a bit we got to this spot that required a small climb. Manuel climbed up and added a rope to help those who needed it. It is handy to carry a small rope I think. Up we went. You can see the rope in the background along with a few people on their way up. 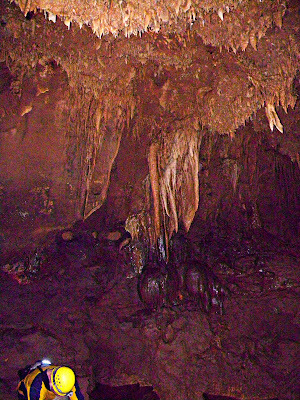 What was kind of different about this cave is that it was dark and a lot of the formations and walls were a deep cocoa color. The ceiling had dark and light areas and formations going in all directions. 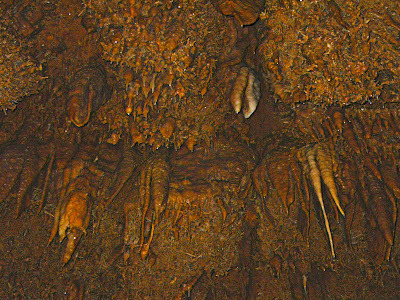 A lot of the formations looked like misshapen carrots or gnarled teeth. Other formations were a kind of three dimensional Jackson Pollack painting. 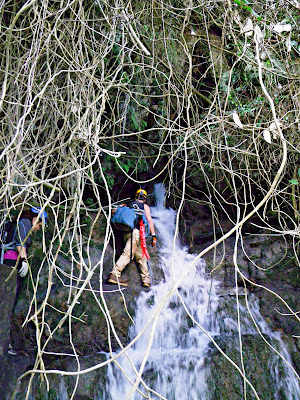 There were layers and layers and layers of twisty root like formations piled one upon another. What you call ice-cream fountain formations, is called flowstone.